You may have watched it already on Netflix, Cartoon Network, or online. Let me tell you that if you've seen the smash anime Attack on Titan, you almost certainly need to own it, and if you haven't seen it, you're almost certainly going to want to. Tomorrow's your chance! 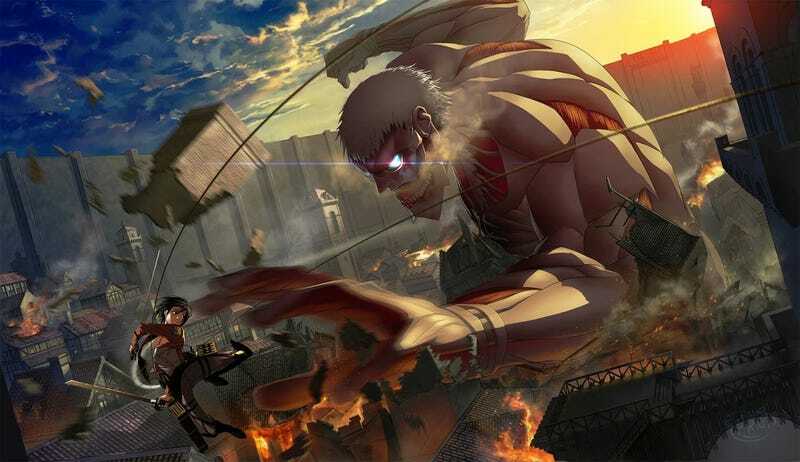 In a world where humanity is constantly under siege by terrifying — and I mean terrifying — humanoid giants who want to eat them, young Eren and Mikasa join the doomed soldiers trying to hold them at bay. The special limited edition comes with a digibook loaded with character art and wacky four-panel comics. An impressively unnecessary remake of the Paul Verhoeven original that tries to get into American military's use of drones but doesn't have the metal cojones to get into it. Hell, it didn't even have the guts (literally) to have an R rating, so I don't know what I expected. The wacky tales of a high school chemistry teacher who decides to moonlight by making candy for adults. It's got all the same stuff as the previous complete series set, including the special bonus disc, so this is just in case you missed it. A verrry strange movie about a group of soldier at an abandoned fort in the early days of the West who run into a crazed cannibal. A semi-horror, semi-comedy that doesn't always work, but my god is it unique. Sookie, Bill and Eric get ready to deal with Warlow, the killer of Sookie's parents, and a new governor who thinks that vampires are public enemy #1. A special three-disc collector's set containing trailers for all 72 movies that were banned or prosecuted by England's Director of Public Prosecutions for depravity and moral corruption, along with a documentary. The Resistance is picking up ground, but discovers new enemies within and without in this latest season (I'm pretty sure). In a post-apocalyptic future, Sean Bean is attacked by mutants and really, really wishes Ned Stark had survived past Game of Thr0nes. Steven Hawking asks why the universe exists, and tackles the existence of God. Uh, figuratively speaking, of course. The 1977 horror movie that… uh… featured a demonic bed killing people. The fact that this movie has come to Blu-ray in an insane, remastered collector's edition is proof we're all ready for the next media format. In the nuclear post-apocalypse — yes, really — a cowboy who sold his soul to the devil has to save a town from zombies. My favorite (and the only) Amazon review: "I haven't seen a really good western zombie film to date. This one is no exception."